Start With A Goal. The Backlog Will Follow. The little pairing project I'm doing with my 'apprentice' Will at the moment started with a useful reminder of just how powerful it can be to start development with goals, instead of asking for a list of features. As usual, it was going to be some kind of community video library (it's always a community video library, when will you learn!!! ), and - with my customer role-playing hat on - I envisaged the usual video library-ish features: borrowing videos, returning videos, donating videos, and so on. But, at this point in my mentoring, I'm keen for Will to get some experience working in a wider perspective, so I insisted we started with a business goal. I stipulated that the aim of the video library was to enable cash-strapped movie lovers to watch a different movie every day for a total cost of less than £100 a year. We fired up Excel and ran some numbers, and figured out that - in a group with similar tastes (e.g,, sci-fi, romantic comedies, etc) - you might need only 40 people to club together to achieve this. This reframed the whole exercise. A movie club with 40 members could run their library out of a garden shed, using pencil and paper to keep basic records of who has what on loan. They could run an online poll to decide what titles to buy each month. They didn't really need software tools for managing their library. The hard part, it seemed to us, would be finding people in your local area with similar tastes in movies. So the focus of our project shifted from managing a collection of DVDs to connecting with other movie lovers to form local clubs. It's similar in many ways to how TDD should work - in fact, arguably, it is TDD (except we start with business tests). When I'm showing teams how to do TDD, I advise them not to think of a design and then start writing unit tests for all the classes and methods and getters and setters they think they're gloing to need. Start with a customer test, and drive your internal design directly from that. Classes and methods and getters and setters will naturally emerge as and when they're needed. When I run the Codemanship Agile Software Development workshop, we do it backwards to illustrate this point. Teams are tasked with coming up with internal designs, and then I ask them to write some customer tests afterwards. Inevitably, they realise their internal design isn't what they really needed. Stepping further back, I ask them to describe the business goals of their software, and at least half the teams realise they're building the wrong thing. So, my advice... Ditch the backlog and start with a goal. The rest will follow. A social media debate that appears to have been raging over the Xmas break was triggered by some tech CEO claiming that the "best developers" would be hacking over the holidays. Putting aside just how laden with cultural assumptions that tweet was (and, to be fair, many of the angry responses to it), there is a wider question of what makes a software developer more effective. The best screenwriters start with great stories, and tell their stories in interesting and authentic voices. To write a compelling movie about firefighters, they need to spend a lot of time with firefighters, listening to their stories and internalising their way of telling them. First and foremost, great software developers solve real problems. They spend time with people, listen to their stories, and create working solutions to their problems told in the end user's authentic voice. What happens when developers withdraw from the outside world, and devote all of their time to "hacking" solutions, is the equivalent of the slew of unoriginal and unimaginative blockbuster special effects movies coming out of Hollywood in recent years. They're not really about anything except making money. They're cinema for cinema's sake. And rehashes of movies we've already seen, in one form or another. because the people who make them are immersed in their own world: movie making. Ironically, if a screenwriter actually switched off their laptop and devoted Xmas to spending time with the folks, helping out with Xmas dinner, taking Grandma for a walk in her wheelchair, etc, they would probably get more good material out of not writing for a few days. Being immersed in the real world of people and their problems is essential for a software developer. It's where the ideas come from, and if there's one thing that's in short supply in our industry, it's good ideas. I've worked with VCs and sat through pitches, and they all have a Decline Of The Hollywood Machine feel to them. "It's like Uber meets Moonpig" is our equivalent of the kind of "It's like Iron-Man meets When Harry Met Sally" pitches studio executives have to endure. As a coach, when I meet organisations and see how they create software, as wel as the usual technical advice about shortening feedback cycles and automating builds and deployment etc, increasingly I find myself urging teams to spend much more time with end users, seeing how the business works, listening to their stories, and internalising their voices. As a result, many teams realise they've been solving the wrong problems and ultimately building the wrong software. The effect can be profound. I'll end with a quick illustration: my apprentice and I are working on a simple exercise to build a community video library. As soon as we saw those words "video library", we immediately envisaged features for borrowing and returning videos, and that sort of library-esque thing. But hang on a moment! When I articulated the goal of the video library - to allow people to watch a movie a day for just 25p per movie - and we broke that down into a business model where 40+ people in the same local area who like the same genres of movies club together - it became apparent that what was really needed was a way for these people to find each other and form clubs. Our business model (25p to watch one movie) precluded the possibility of using the mail to send and return DVDs. So these people would have to be local to wherever the movies were kept. That could just be a shed in someone's garden. No real need for a sophistated computer system to make titles. They would just need some shelves, and maybe a book to log loans and returns. So the features we finally came up with had nothing to do with lending and returning DVDs, but was instead about forming local movie clubs. I doubt we'd have come to that realisation without first articulating the problem. It's not rocket science. But still, too few teams approach development in this way. So, instead of the "It's like GitHub, but for cats" ideas that start from a solution, take some time out to live in the real world, and keep your eyes and ears open for when someone says "You know what's really annoys me? ", because an idea for the Next Big Thing might follow. Sunday morning's often my time for doing admin and logistical-type stuff, like booking flights or trains or hotels. Today I searched for a hotel near a client's offices, then booked through the chain's website. After that I copied and pasted the hotel's address to search on Google Maps for a decent restaurant nearby, and then pasted the restaurant's name into Trip Advisor to see reviews. Satisfied, I then pasted the hotel's postcode into an app for booking a taxi to the client site on the first morning because it was 2 miles away (and I find walking to strange places in strange towns a bit risky on the first day). Finally, I searched on Trainline and booked reserved seats, because it's way cheaper to do in advance. And it occurred to me that there was a lot of browser tabs and copying and pasting involved, creating the impression of some kind of workflow. 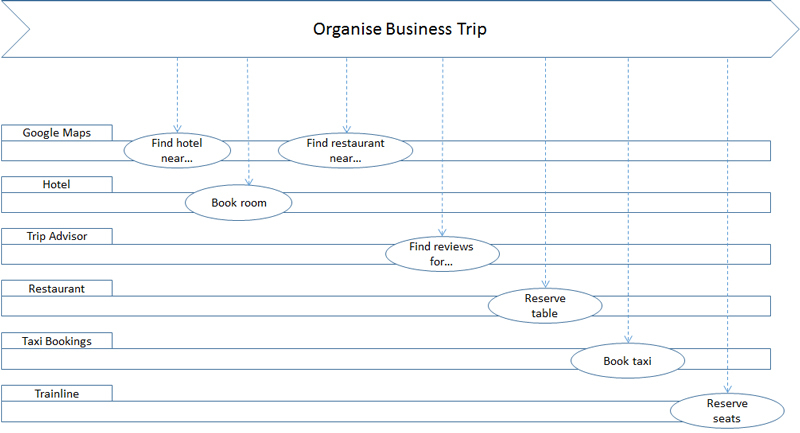 This workflow sits above the use cases of Google Maps, the hotel's website, Trip Advisor, the restaurant's website, the taxi booking site, and Trainline. The reason I'm mentioning all of this is three-fold: firstly, if I were designing these systems, I would find this kind of context very useful. Right now, to move from one step in the workflow to the next, I have to open a new browser tab, go to the right web page, and paste in data from a previous step. Clunky! Studying these real world workflows can help us to smooth out these kinks. For example, if we found that 50% of people who book hotel rooms on our site then go on to search for nearby restaurants, we could add a link that will take us straight to Google Maps and fill in the data for us. Secondly, and more importantly, when software design's done right, we start by thinking about business goals and about business workflows, not system features. This technique helps us to identify system use cases from the outside in, starting with the business context. That's as it should be. And thirdly, it makes good business sense, when we're designing applications, to ask ourselves "where are the user's coming from?" Have they just booked a hotel? Did they just book a flight? Work your way backwards and build relationships with the developers of software that might - indirectly via search engines, perhaps - be sending users our way, so we can work with third parties to smooth that path. And, likewise, smooth the user's path to downstream activities in their workflow. What are they likely to want to do next? In sales and marketing, it's essential to understand what triggers buyers' needs, so you can pitch your tent right outside that triggering event, so to speak. There's a reason why late-night petrol stations sell flowers and firelighters, and it has absolutely nothing to do with selling petrol. Arguably, this is how the web should work now. Not links to content, but controls for triggering actions in other people's systems - an event-based (rather than content-based) model. But it doesn't. So we'll have to hand-wire that sort of thing ourselves. And this isn't just relevant to web-based workflows, of course. An end-to-end sales scenario in your company many involve multiple workflows, enacted using multiple systems. Work to understand those workflows, and smooth the user's path from one step to the next. See them copying and pasting data from one system to another? That's a hint that there's more automation to be done. A classic source of tension and dysfunction in software teams - well, probably all kinds of teams, really - is the relativity between goals and constraints. Teams often mistake constraints for goals. A common example is when teams treat a design specification as a goal, and lose sight of where that design came from in the first place. A software design is a constraint. There may be countless ways of solving a problem, but we chose this one. That's the very definition of constraining. On a larger scale, I've seen many tech start-ups lose sight of why they're doing what they're doing, and degenerate into 100% focusing on raising or making the money to keep doing whatever it is they're doing. This is pretty common. Think of these charities who started out with a clear aim to "save the cat" or whatever, but fast-forward a few years and most - if not all - of the charities' efforts end up being dedicated to raising the funds to pay everybody and keep the charity going. Now, you could argue that a business's goal is to make money, and that they make money in exchange for helping customers to satisfy their goals. A restaurant's goal is to make money. A diner's goal is to be fed. I give you money. You stop me from being hungry. Which is why - if your organisation's whole raison d'être is to make a profit - it's vitally important to have a good, deep understanding of your customer's goals or needs. That's quite a 19th century view of business, though. But even back then, some more progressive industrialists saw aims above and beyond just making a profit. At their best, businesses can provide meaning and purpose for employees, enrich their lives, enrich communities and generally add to the overall spiffiness of life in their vicinity. But I digress. Where was I? Oh yes. Goals vs. constraints. Imagine you're planning a trip from your home in Los Angeles to San Francisco. Your goal is to visit SF. A constraint might be that, if you're going to drive, you'll need enough gasoline for the journey. So you set out raising money for gas. You start a lemonade stall in your front yard. It goes well. People like your lemonade, and thanks to the convenient location of your home, there are lots of passers-by with thirsts that need quenching. Soon you have more than enough money for gas. But things are going so well on your lemonade stall that you've been too busy thinking about that, and not about San Francisco. You make plans to branch out into freshly squeezed orange juice, and even smoothies. You get a bigger table. You hire an assistant, because there's just so much to be done. You buy a bigger house on the same street, with a bigger yard and more storage space. Then you start delivering your drinks to local restaurants, where they go down a storm with diners. 10 years later, you own a chain of lemonade stalls spanning the entire city. Meanwhile, you have never been to San Francisco. In fact, you're so busy now, you may never go. Now, if you're a hard-headed capitalist, you may argue "so what?" Surely your lemonade business is ample compensation for missing out on that trip? Well, maybe it is, and maybe it isn't. As I get older, I find myself more and more questioning "Why am I doing this?" I know too many people who got distracted by "success" and never took those trips, never tried those experiences, never built that home recording studio, never learned that foreign language, and all the other things that were on their list. For most of us - individuals and businesses alike - earning money is a means to an end. It's a constraint that can enable or prevent us from achieving our goals. As teams, too, we can too easily get bogged down in the details and lose sight of why we're creating the software and systems that we do in the first place. So, I think, a balance needs to be struck here. We have to take care of the constraints to achieve our goals, but losing sight of those goals potentially makes all our efforts meaningless. Getting bogged down in constraints can also make it less likely that we'll achieve our goals at all. Constraints constrain. That's sort of how that works. If we constrain ourselves to a specific route from LA to San Francisco, for example, and then discover half way that the road is out, we need other options to reach the destination. Countless times, I've watched teams bang their heads against the brick wall trying to deliver on a spec that can't - for whatever reason - be done. It's powerful voodoo to be able to step back and remind ourselves of where we're really headed, and ask "is there another way?" I've seen $multi-million projects fail because there was no other way - deliver to the spec, or fail. It had to be Oracle. It had to be a web service. It had to be Java. No. No it didn't. Most constraints we run into are actually choices that someone made - maybe even choices that we made for ourselves - and then forgot that it was a choice. Yes, try to make it work. But don't mistake choices for goals.